There are some reviews you can’t wait to write. Then there are reviews where you wish you had skipped the place returning to wondering every time you pass by if it is any good. Potential is far better than disappointment. Sadly my first gas station taco in Los Angeles was a disappointment causing me to wait a good month before I finally got around to writing this review. I relocated to Los Angeles from Dallas last month and wondered what would become of my Gas Station Taco Blog. Would I find any gas station tacos in LA? Sure I’d find tons of excellent tacos. My love of street tacos began here in the late 1980s when I used to go to the taco trucks long before “food trucks” were plastered with Twitter accounts and Facebook URLs. 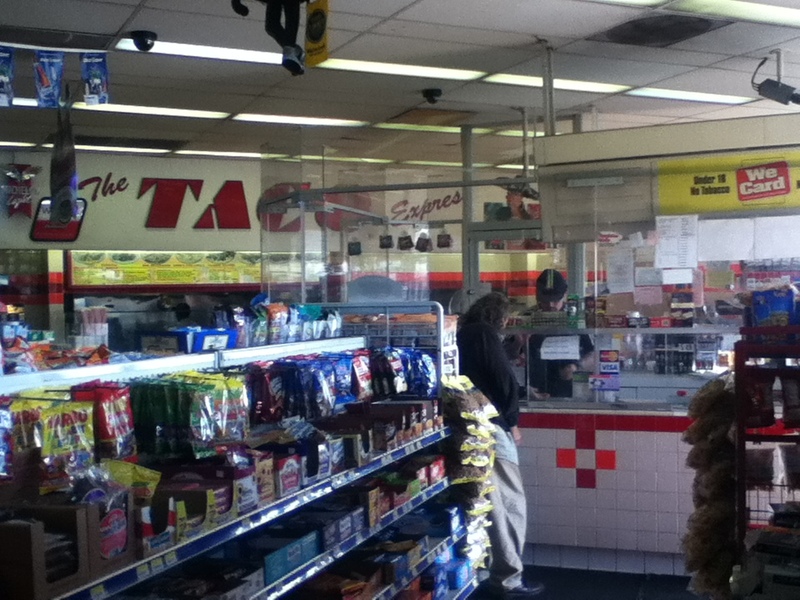 In fact, my absolute favorite taco blog is The Great Taco Hunt based here in LA, but would I find gas station taquerias? I only knew of one: Taco Express. I had passed it several times coming into and out of LA on travel as the rental car shuttles passed it. I had stopped in to try it a couple times, but the place was closed. Taco Express is inside an Arco station with a full kitchen in back advertising only beef and chicken tacos plus a variety of other typical Mexican options. I ordered two of each taco choice on corn tortillas with only onion and cilantro. I also asked for a side of hot sauce. They serve a mild pico de gallo sauce too. My first bite into the chicken taco wasn’t good. The meat was rubbery and flavorless. I tried two more bites then decided to pass on the rest of the chicken tacos I had ordered. The beef taco was slightly better. At least the meat is lean, but like the chicken there just isn’t much flavor. I added some more of the hot sauce which has a rich red color and some decent heat. Overall the beef taco is an okay choice if you really want a taco before leaving or arriving at LA Airport, but with so many better taco trucks around town I’d personally wait for a better option. Before I had an opportunity to try Taco Express a friend of mine here in LA, Stephanie White, made a visit. Here are her and her friend’s thoughts. I live in Los Angeles, and the only gas station tacos I’d ever seen were in a glass case in an AM/PM or in a Taco Bell attached to the mini-mart. Maybe they’re like Frito-pie stands in New Mexico? I asked, but no. As Chris did his best to explain this gas station taco phenomenon, I was sure I’d never seen (nor smelled!) one, even on road trips to other states. Then one day, feeling a bit sheepish that I hadn’t really looked for one, I found what must be the only LA-area gas station taco, Taco Express. Minutes later, I got a tweet with the same find — I knew I had to go check it out. 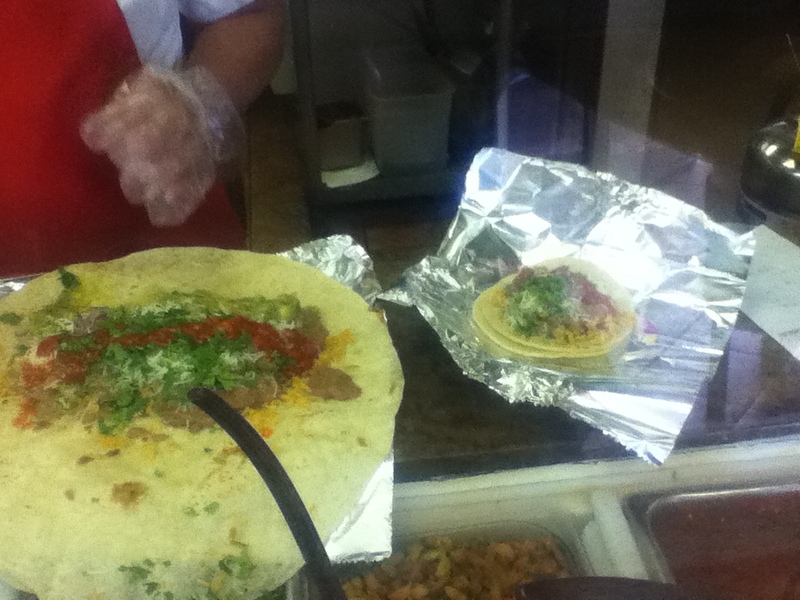 Of course, there was one caveat– not only would it be my first gas station taco, it was going to have to be vegetarian. But don’t worry — I had a friend try some of the meat tacos, so I could report back. 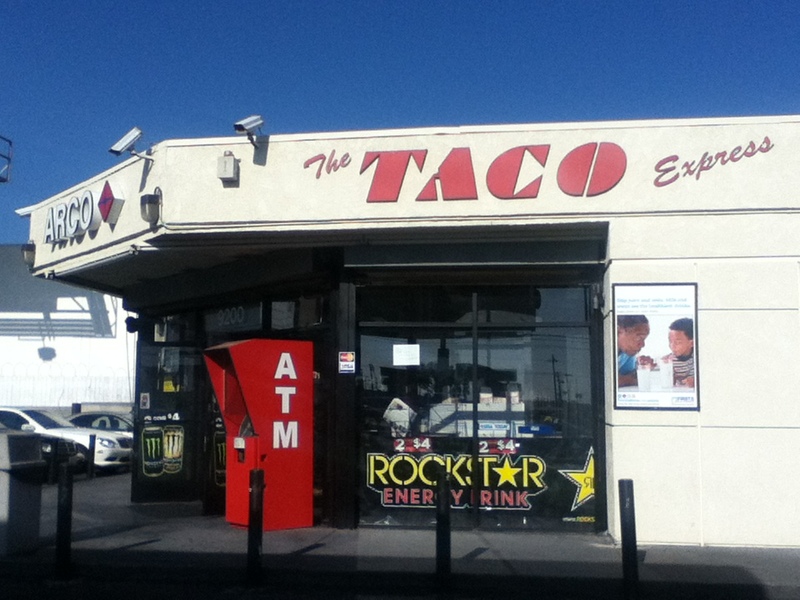 Armed with memories of the most recent GasStationTacos.com posts and a few Yelp reviews (the comments are a testament to this oddity in LA) — I drove toward LAX, found the ARCO station and the sign I’d been looking for: The Taco Express! I was even more excited when I saw the colorful sign (with pictures of plated food) outside on the mini-mart wall proclaiming the vegetarian burritos! I could smell the food the minute I got out of my car. My friend, Steve, laughed at the idea of gas station tacos, but he trusted me on this one, and decided to give it a try. The shiny red-tile counter sits under the same ’80s-era logo, a faded paper menu stands at the counter top, and a sign sits in the window that reminds you: This is not Fast Food, it’s quality food served FAST! Surrounding the counter and the drink dispenser to the side are more bagged tortilla chips than you could ever hope to use at a Cinco de Mayo party. The bright menu board lists a few breakfast options (tacos and burritos with eggs & chorizo if you get there before 10am), but none could be made vegetarian, so my first breakfast taco experience would have to wait. Thankfully, the menu provides detailed descriptions (and photos!) so you know exactly what you’re getting with your order: tacos (steak or chicken), burritos (vegetarian, chicken, or steak), tortas, quesadillas, nachos, and salad — this is LA after all. While I waited to let a few others order (I was curious to see what they got), I snapped a few photos as tortillas were filled with hot and cold ingredients behind the glass. The other patrons said the burritos are best, but each ordered tacos as well. While the tacos are $1.25, everything else on the menu is $3 – $5. I’m sure they didn’t understood why I was so happy to be there, but they helped me decide on a veggie taco (secret menu!) and a veggie burrito. The LA-version of the gas station taco only has two meat options, chicken and steak, unlike some of the delicacies offered in Texas. The tacos are on two stacked (moist!) corn tortillas, and my veggie came with rice, flavorful refried beans, cheese, fresh onions & cilantro. I’m not a fan of raw tomatoes, so I skipped those, and opted for the hot salsa instead of the mild, which is a saucy pico de gallo. I asked for limes, and she asked if I also wanted radishes and a roasted jalapeno — of course! — so she wrapped them up in aluminum foil which kept them nice and chilled. Steve ordered a steak taco and a chicken taco. He had his made with onions and cilantro, then he added lime and mild salsa (much preferred to the hot, he said). My vegetarian burrito was big and heavy. They fill the flour tortilla with rice, beans, cheese, onion, cilantro, guacamole, lettuce, tomato — I love lettuce, but not in my burritos, so I skipped that and the tomato again, and chose hot salsa. She looked a little worried and offered to put it on the side, but I promised I’d be ok. I happily took the paper bag with the tortilla rounds, my foil-wrapped taco, burrito, and veggies, and headed to the car. 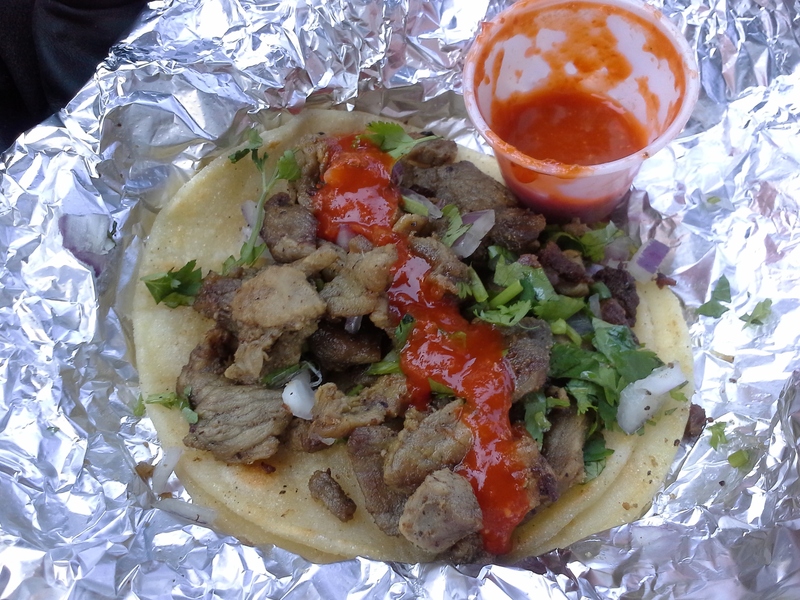 I devoured the taco in about 10 small bites — the flavors mixed well, the lime was juicy, and the salsa was indeed nice and warm, with a dominant flavor of red chilies. Sadly, Steve was not impressed with the quality of the meat in his tacos, and found the meat tough and gristly. It was time to try the burrito. The flour tortilla was nicely balanced with the filling. Their “delicious beans”, rice, cheese, and onions melted into one another, while every few bites brought the coolness of cilantro and guacamole. I ate half of the burrito, went back in for a side of their hot salsa, and then took the rest of the food home. I was really impressed with how well the burrito held its shape (and its warmth). I finished it about 30 minutes later, with more lime and salsa, and polished off the mild salsa with the chips. Overall, the food tasted like authentic Mexican food (minus the lard and associated heaviness), and I was sorry I hadn’t discovered this place sooner. I appreciated the fresh vegetable condiments, and the facts that they used foil and paper, instead of Styrofoam or plastic. It’s likely that I will go back and try some other items from the menu, along with more of those veggie tacos. Steve said he’d give the meat tacos another try, but otherwise, he’d be back for the vegetarian food at The Taco Express.